Nikki Packer, who has been working as a VSO volunteer in the Lubuto Library Project in Zambia, sent on a review she did of The Butterfly Heart. Thanks for that Nikki. The Butterfly Heart tells the story of Bul-Boo and her sister Madillo, as they attempt to save their friend Winifred from a forced marriage. The modern, financially stable life of Bul-Boo and her family contrasts with the less fortunate situation of Winifred, whose mother has also been forced to take a new husband; but also with the more traditional family of Fred, the next door neighbour, whose grandmother has supernatural powers and whose mother, despite being English, is very retiring. Bul-Boo’s mixed cultural background (her mother is Irish) is a clever way to explain the cultural beliefs at stake to the European reader, and the sensitive issues at the heart of the book are carefully handled. As well as the central theme, the book deals with sibling rivalry and family relationships, HIV and AIDS, witchcraft, education, multicultural marriages, trust and friendship. The characters are well developed and none of them feel 2-dimensional; all have flaws as well as positive points, and are described effectively. We are given a feel for the history of characters such as Ifwafwa the snake man, and Fred’s mother, but allowed to use our imagination to fill in the gaps. This is important in such a short book. Having lived in Zambia (and in the area where Bul-Boo lives) I felt that the setting was factually correct and described in lyrical language which creates an easy imagery. I could really feel myself walking the streets of Bul-Boo’s home town, and do not think that this was just because I have been there in real life. Books set in developing countries can sometimes appear patronising in their attempts to explain a new culture to the Western reader, but Leyden has not fallen into this trap. This is a believable, thought provoking story which is told in a realistic way. An interview and Review with the lovely team at Gobblefunked ! Here are two reviews by students from Headfort School, Kells, County Meath. I visited the school briefly last week, October 10th 2012. A fascinating school – but more about that later. Here are Lucy and Holly’s reviews. Thank you Lucy and Holly – I love hearing that the book was hard to stop reading! Music to my ears. This review appeared on the website Writers Write. Thank you to Carey Berning for giving it a 5 out of 5! The Butterfly Heart is a wonderful story based in Africa. This is the story of a girl called Winifred whose father dies. Her uncle becomes her new father and she is forced to marry her uncle’s friend. Her two friends, Madillo and Bul-Boo and the Snake Man Ifwafwa, try to help her get away. What I liked most is that you get to read about the different characters’ points of view. I think it is more suitable for girls, from 12 to 15 years old, who are interested in a slightly different type of book. It was a brilliant story and I loved reading it. 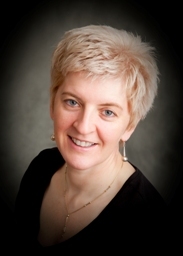 Paula Leyden was born in Kenya and spent her childhood in South Africa and Zambia. The Butterfly Heart is Paula’s first novel, and is endorsed by Amnesty International. A couple of months ago, The Butterfly Heart came to our attention. This is the kind of book we’d like to see more of — quality writing about Zambia and Africa’s culture, history and how we can go boldly forward into the future. We got two members of our team to write book reviews. If you want a copy of The Butterfly Heart, get it here. The Butterfly Heart — touching, enthralling and enlightening. Written by Paula Leyden, this is one of those rare books that will be at home in the hands of children, teens and adults. Though these 200 pages carry a serious message about the challenges and secrets some children are burdened with, this story is not told from a preachy moral high ground. Paula’s knowledge and experience of Africa (Kenya, Zambia and South Africa specifically) shines through in the way she has strung together this wonderful concoction of words. This book attempts to express the challenges of deep rooted cultural beliefs, versus the expectations and aspirations of a modern way of life. I could tell you about the wonderful characters — the larger-than-life and contemplative twins, Madillo and Bul-Boo, Winifred the young girl who comes to school with ‘plastic bags tied carefully around her shoes so they didn’t get muddy’, Fred from next door with a witch for a Grandmother and of course, Ifwafwa the snake man — but I don’t want to. Instead, I’d like you to find out about them for yourself because then you’ll find out why this very special book has been endorsed by Amnesty International. Paula Lyden manages to weave a gripping tale through a simple story about the threat to the innocence of childhood, the strong ties of friendship and a hint of magic. This book is an easy read and can be read by all ages. The story revolves around Madillo and Bul-Boo, two very different twins, the latter much more contemplative and reserved than her outspoken and sometimes over imaginative sister. When one of their closest friends Winifred is faced with a terrifying fate, the twins call upon Ifwafwa, the local snake man to help. But their faith in Ifwafwa wavers as Winifred’s time runs out, and they come up with all sorts of ideas to help their dear friend before it is too late. The story is made interesting and even hilarious at times, with an assortment of different characters such as Sister Leonisa, the girl’s teacher who is a religious fanatic that exaggerates every lesson to fit her warped view of life, and their neighbour Fred, who has a witch for a Grandmother. Paula does a fine job of allowing the reader to see the story from each of the characters points of view, by expressing their thoughts and their feelings at every turn. Her knowledge of Zambia is evident in her expression of culture and lifestyle, and though it is sometimes off key, it is mostly accurate. One of the most intriguing characters in the story is Ifwafwa, the snake man. Because the character is so important to this story, it is easy to notice the weaknesses related to him. For example, he is portrayed to have a close relationship with the children and they spend a lot of time with him. But I find this a bit unrealistic. Surely no parent would allow their young children to spend so much time with a man who always has dangerous snakes in his bag? (Though children are known to be sneaky at times). I find that Ifwafwa’s tale remains unfinished. The reader is taken on a journey into Ifwafwa’s past about his murdered Grandmother and Mother. But the story ends with no conclusion of what became a vital part of the story for me. Drum roll for a sequel? All in all, The Butterfly Heart is a worthy tale and definitely worth the read. It’s nice to see people taking inspiration from Zambia and helping to raise its profile through the written word. ‘There are some things that are so awful you wish you had not heard them. Ever. 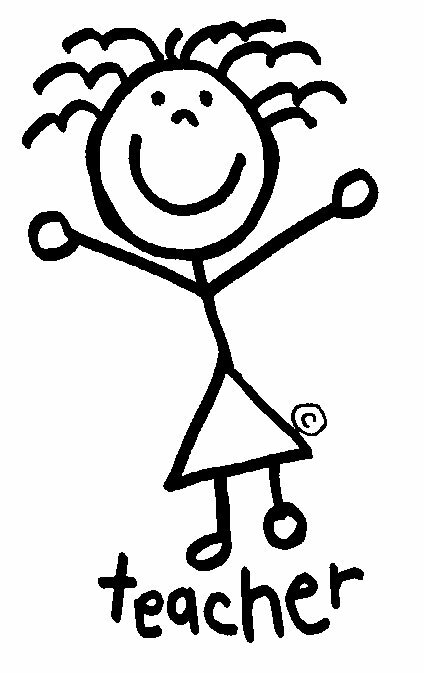 What Winifred told me today is one of those things.” That is Bul-Boo’s diary entry. It offers a glimpse of the kind of burden a secret places on a child who would rather be preoccupied with happier things, such as picking fights with her twin sister, Madillo, and playing with the next-door neighbour, Fred. The Butterfly Heartdraws its name from the shape of Zambia, where this lyrical story is set. It is told in a humorous and childlike manner, yet there is nothing childlike about its subject matter – forced marriage. 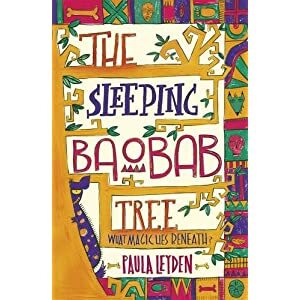 Author Paula Leyden sensitively introduces this culturally controversial issue through the eyes of Bul-Boo in the first person, interspersed with a narrative from Ifwafwa, the snake man who not only saves the day, but saves Winifred’s life. Leyden, who partly grew up in Zambia and Kenya, says of her decision to tackle forced marriage: “A school friend of mine disappeared into a forced marriage when we were both in primary school. The thought of her never left me. Bul-Boo’s classmate, Winifred, is from a poor family and after the death of her father, her uncle imposes himself upon the family, marrying her mother according to tradition. Unlike Winifred’s late father, her uncle is a cruel, imposing and violent man. Winifred’s mother has no reproductive rights. She is forced to bear child after child under unpleasant circumstances. Things become worse when Winifred’s uncle decides to give her hand in marriage to his drinking buddy. She is forced out of school to prepare for this ordeal. The girls, aided by their neighbour, Fred, seek counsel from Ifwafwa, the local snake whisperer, who is said to have supernatural powers. Thrown into the storytelling mix is the girls’ teacher, a nun, who has wild stories to tell the children. We also read about the twins’ happy home life that they share with their Zambian father and English mother. This is in stark contrast to Winifred’s desperate home life. Perhaps the most taxing part of this story is Leyden having to step through the potential minefield of tradition versus modernity while also taking into consideration the rights of the people in her story. “I think anywhere you find yourself in the world, you become aware of old ways and new ways rubbing against one another. It is how history is shaped. Comfortable traditional ways of doing things come up against new and untested ways. But Leyden adds that her novel also addresses the way parents listen to their children – or not – dismissing their stories as just that. “Quite often, children will pick up things that may be happening to other children that they are in contact with. As parents and adults, we need to hear these things and not dismiss them as silly child talk. The book has been endorsed by Amnesty International UK as “contributing to a better understanding of human rights and the values that underpin them”. After the book was launched in Ireland, now the author’s home, schools were encouraged to get involved. Scholars from schools in Kilkenny met with Leyden and created visual representations of their understanding of the story. 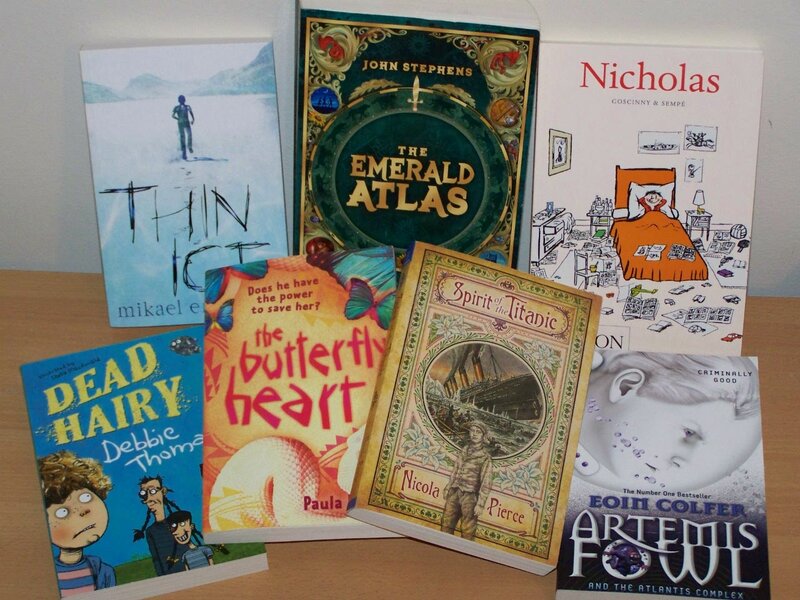 This was all in the interest of getting young people to read and, more importantly, to read stories that they can relate to, or use to help understand the lives of those around them. The Butterfly Heart tells a magical tale that is full of wisdom and wit. This is an incredibly touching story that respectfully speaks to tradition in a simple but powerful way. It is definitely one for the shelves of the young adults in your home. Paula used to live in Africa. After university, she taught for five years. Then she worked in the area of human rights in South Africa. Once democracy came, she worked for a human rights awareness campaign. She played a considerable part in the abolition of the death penalty there. She moved to Ireland 8 years ago. That’s when she began to write. Date/Place of Birth: 1958. Place: Nyrei, Kenya. Her father was working for the British Government there. Education: Initially in Zambia. Then in England; then South Africa for University. Home: A farm in Kilkenny. Family: Partner and five children, including twins of 18. Set in Zambia, the novel is aimed at 10 to 12 year olds. “It’s told through the voice of one of a pair of twins; a young girl called Bul-Boo, and the alternate voice is Ifwafna, the snake man. A school friend of the twins is to be married off to an old man. Bul-Boo wants to prevent this, and she consults the snake man. And there’s a fantastical element in the resolution of it. The Verdict: This enchanting tale is like Alexander McCall-Smith, but for kids. Ambrose Musiyiwa writes a blog entitled Conversations with Writers . He is based in Leicester in England now but hails from one of Zambia’s neighbours, Zimbabwe. He interviewed me for my book and the interview can be found here. Thanks for this Ambrose, I appreciate it. 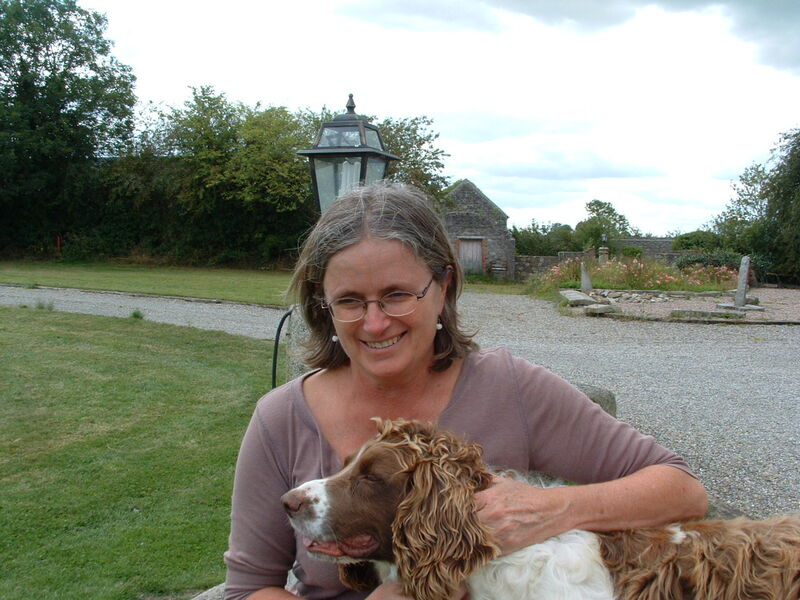 Colleen Jones is a Canadian writer for children and she now lives in Cork. She writes a blog called A Three Legged Rabbit Called Dave (great blog name) and this week she reviewed my book. Take a look at her site! Thanks for this Colleen, great review. Paula’s book reminded me of something I had forgotten. Growing up in Canada, I knew a girl who was taken out of school and sent away to marry someone when she was only 14. I had no concept of what it meant for her. All I knew was that she had disappeared out of my life completely. You might wonder how in the world someone can take such a difficult and serious subject as child marriage and write a palatable story suitable for kids to read. The Butterfly Heart is a warm and engaging story, and I was drawn in from the first page. The book opens with: “My friend Winifred didn’t put her hand up today. Not once.” From those two sentences, I knew that Bul-Boo was thoughtful and observant, and that Winifred was not acting like her normal self. I was worried I might find the world in the story too exotic and different for me to relate to, but Paula has done a fine job of creating an accessible, fond portrait of Zambia, its culture, and its people. I very quickly grew to care about Bul-Boo and her outgoing twin sister Madillo, their friends and family, and mysterious Ifwafwa, the snake man. There is a gentle humour throughout the story, especially in the school scenes featuring Sister Leonisa’s rather unique teaching methods. Paula weaves traditional Zambian folklore into her tale, and there’s a whiff of magic in the air. I was a little concerned that Paula might be breaking one of the golden rules of writing for children: get the grownups out of the way and let the kids solve the problem on their own. But what I found was that because I learned something of Ifwafwa’s childhood, his joys, sorrows, and fears, he seemed more vulnerable and childlike and not the all-powerful adult. And while Bul-Boo has asked for help, the children are actively trying to fix things themselves. The resolution is not what I expected, and it works wonderfully. So the golden rule may have bent a little, but it is still intact. Paula has a second book being published by Walker and is writing a follow-up to The Butterfly Heart, and I am looking forward to both! Mary-Shine Thompson (whose next book Young Irelands: Studies in Children’s Literature , will be published by Four Courts Press later this year) reviewed The Butterfly Heart along with five other books in the Irish Times today. Here is what Mary said about The Butterfly Heart . Paula Leyden is that rare thing a natural storyteller who conjures a rich magical-realist terrain in which sorcery and modernity coexist. Her Zambian childhood provides the material for her moving debut, The Butterfly Heart (Walker Books £5.99 ). The world beyond school, cursed with poverty and Aids, begins to impinge on twins Bul-Boo and Madillo. They discover that their little schoolfriend Winifred is to be married off by her drunken uncle to his drinking companion. Ifwafwa, who keeps homes free of snakes, counsels them. With parents who are medical doctors, the twins inhabit a dual world of science and of folklore at odds with Winifred’s and Ifwafwa’s traditional lifestyle. Leyden intimates that child marriage is barbarous, but resists didacticism. Her portrait of the children’s woefully ignorant teacher, Sr Leonisa, is convincing and hilarious – if ignorance were not so tragic. A big thank you to Mary Shine Thompson! Reconciling English ideals with Zambian and African traditions. A wonderful review by Mwanabibi Sikamo appeared on her Blog Uprooting the Pumpkin. Mwanabibi’s blog is a treasure trove to visit – she updates it regularly and highlights issues as diverse as skin lightening creams, domestic workers, music, love, colonialism, HIV/AIDS, more music and train journeys through Africa. A few weeks ago I embarked on a challenge to review a book a month from African countries, the enormity of this task did not hit me at the time. Readingwould not be a problem. I love reading and often have many books on the go. It was the ‘writing of a review bit’ that was a little scary. It seems easy enough. Write a synopsis of the plot and give a short opinion of the story and style. Nothing is ever that simple for me. Saying what the story is just doesn’t cut it. When I read, it’s more about how the book makes me feel. Take for example Wizard of the Crow, Ngugi Wa Thiong’o or The Famished Road, Ben Okri. I absolutely love those books; just don’t ask me what they were all about. The words and sentences are what draw me in. Language is, in my opinion, a true form of art. Discovering a gem of a book is the height of excitement for me, I take note of striking words and sentences; the mark of my enjoyment is the pages and pages of scribbles in my little notebook. There are two kinds of book I love. The first is the kind I can relate to, the books that show me something about myself or reflect my life experiences. The second kinds are the ones that are beautifully written, the language evokes emotion. They do not shout stories at you or draw too much attention to themselves instead they coax you in, invite you to savor the experience and leave an imprint on your mind.The really good ones are able to convey an argument and make you re-evaluate your ideas. Paula Leyden’s ‘The Butterfly Heart’ is the second kind. My copy is full of post it notes! It is a book about two children, Bul-Boo and Madillo, in Lusaka,Zambia who discover that their friend is in danger. They embark on a mission to rescue her with the help of ‘the snake man’, Ifwafwa. It is technically a children’s book but can be enjoyed by all ages. It’s a brilliant story, very well told. It tackles extremely serious issues in a way that is not preachy, this is highly effective because we as readers are often desensitised by people shouting down at us. The perspective of the tale through a child’s eye is the triumph of this book. Their innocence endears us to them and makes the story all the more powerful. What I liked best though, was the portrayal of Zambia. It was like I was seeing it from a completely different outlook. I know a lot of the traditional stories and the places, but when I read the book it felt like I hadn’t really appreciated them. The title of the book is a great example of this! The Butterfly Heart refers to the shape of Zambia, a butterfly in the heart of Africa. I’ve had to draw the map of Zambia on numerous occasions at school and all I saw was an annoyingly difficult to copy shape that is the legacy of the colonialists need to share our mineral resources. Madillo counts her steps home everyday. On one particular day she decides to count in Bemba (a Zambian language) her sister found this particularly tedious. I thought it was hilarious! Counting in Bemba is like Roman numerals in words. Needless to say it took a long time to get home. I guess its like Bul-Boo said, ‘you put it into words that someone who’s never been to Africa would understand’. In a review of the book the children’s laureate, Siobhan Parkinson asserted that after reading it she wanted to visit Zambia. It made me want to visit Zambia, and I was born there. Paula’s love for the country is seared on every word of this book. She has read and supported this blog from the very beginning and I was really excited to be able to speak to her about her work and the inspiration behind it. My family moved to Zambia in 1964 at the start of Zambia’s life as an independent state. I was born in Kenya and was five when we moved first toKitwe then to Lusaka. I think that the reason Zambia had such an impact on me is that I spent the most aware part of my childhood there, as we left when I was fifteen. I think for all of us our childhood memories are very strong. I also think that because we moved from there to South Africa (my dad’s work took him there) the contrast between the two countries was so sharp that my memories of Zambia remained at the forefront of my mind. The warmth, the heat of the ground under my feet, the music of the voices around me, the lack of consciousness in my mind of race and difference – all these things were shattered on moving to SA , a place of apartness, brutality and anger. 2. How much did your experience there influence and/or reflect the books setting and characters? My experiences there affected every part of this book – because my memories were so vivid. The characters that appear contain little bits of people who have been in my life – I do not know if it is like this for everyone who writes but I observe people, I cannot help myself. I am continually entertained and fascinated by the way people move through their lives, and my characters emerge through this. 3. Out of interest. What goes into writing a novel? How long does it take? This book, The Butterfly Heart, took me a few months to write. But what takes more time than that is the thinking, the reading, the research. It is important for me, whatever I am writing about, to try and get it right. I think as a writer you owe that to those whose lives may be reflected in the things you write. 4. What was your inspiration for the story and its subject matter, child marriage? One of my primary school friends at the Dominican Convent in Lusaka did not return to school one term and we later learned that she had been married off to a much older man. We never saw her again. The memory of her remained with me always, so I decided to write about it – not her story but a story that reflected the issue. 5. Why did you consider it particularly important to tackle that issue? I regard childhood as enormously precious – I feel infinitely privileged myself to have had a childhood that was happy. We bring children into this world – we need to protect them. If we as adults cannot do this then this reflects badly on the way we manage society. I think child marriage is fundamentally abusive – it wrecks her body, often leading to premature death in childbirth or through HIV/AIDS and dulls her soul – it condemns her to a life often not worth living. 6. I am always amazed at how books written about ‘far off’ countries can resonate with those in the west. Why do you think this is? That’s an interesting question Mwanabibi – I think that people wherever they are have a natural curiosity about the way others live. About countries they may never get to visit. Books can create a window into these other worlds. Now, with the recession in the West, people are also looking to understand things beyond themselves – in a curious way the hardships of the current climate take people out of themselves into a less selfish space. 7. The folk tales and language in the book are very accurate. What kind of research did you have to undertake? Reading, reading and more reading. I accessed books where old tales had been translated, I scoured the web and I searched my memory! Not a hardship at all as the tales themselves are so wondrous to read. I wanted to get it right and am glad to hear you think I did. 8. You have expressed an interest in supporting more local writing in countries like Zambia. Why is that? On a recent visit to the Bologna Children’s Book Fair I was saddened by the absence of an Africa presence – all the other continent were well represented Asia, Australia, the Americas and Europe – but there was very little from Africa. It upset me as this is a continent where storytelling, magic, folklore and tales are the stuff of everyday life – there is an enormous richness. Yet this is not reflected, because of a lack of resources, in books for children coming out of Africa. My own book is set in Zambia and so if there is any way I can encourage more of this to happen I would like to do it. Paula has recently completed the first draft of a sequel to The Butterfly Heart which follows the story through the eyes of Madillo and Bul-Boo’s friend and neighbor Fred. If it’s anything as good as the first one it’ll be brilliant! Her blog The Butterfly Heart is highly enjoyable and I definitely recommend a visit. If after reading this you still haven’t got a clue what the book is about, I apologise and invite you to read a fantastic review by Bwalya Chileya on her blog Seize the Moment. Review in The Sowetan newspaper, June 27 2011, written by Mpikilemi Duma. The characters or protagonists, Bul-boo and Madillo (two girls), are powerless to save their friend Winifred from a terrifying fate, and time is slipping away. In desperation they call on Ifwafwa, the “snake man”. But though the old man is wise, he is slow and the girls become impatient. The Butterfly Heart was reviewed this week in the Zambian Economist – a constantly updated and informative site on Zambia, its economy and so much more. Well worth visiting. Bwalya herself blogs at Seize the Moment, take a look! Thank you to Bwalya and Chola for doing this. I sent a copy of my book to Vivienne, the creator and author of the wonderful Serendipity Blog – an endless source of information and comment on all things books. She kindly reviewed The Butterfly Heart and conducted an interview with me which she published last week. Thank you for that Vivienne and I am delighted you liked the book! The interview is here, and I have reprinted the review below. Book kindly sent to me by the author for an honest review. My friend Winifred didn’t put her hand up today. Not once. She hardly put her head up. I kept looking at her sideways, waiting. But nothing. When the bell rang, she slipped out of the classroom as if she had never been there. Like a shadow. I stayed sitting for a while, wondering. Maybe she was having a quiet day. Surely everyone has those? Or maybe she didn’t know any answers. No. Not likely. The story is set in the butterfly heart of Africa. Bul-Boo and Madillo are desperate to help their friend Winifred from a fate no child should ever have to deal with. Winifred is slowly going into a decline. Out of desperation they plead with Ifwafwa, the snake man to help Winifred; to save her from her future. Ifwafwa agrees to help, but the girls find themselves impatient with his progress. Will he manage to save Winifred before it is too late? When I get a book like this, it makes me realise how much I love book blogging. A few weeks ago the author approached me to ask if I would review her book, I quickly had to find out more about it as I had never heard of it before. I was extremely curious by the endorsement of the book by Amnesty International UK and immediately agreed to read it. As I began reading it, I found myself smiling with delight, because I had found myself a sparkling gem that needed to be seen by everyone. The writing in this book is utterly beautiful. I found the story just flowed off the pages like a winding, lazy, river. It is one of the quiet books, where everything happens in a quiet way but produces immense results, leaving you feeling satisfied that everything has been dealt with. Bul-Boo and Madillo were an extremely entertaining set of twins. Madillo is just hilarious with her fabricated stories which she dramatically presents to everyone who will listen. Bul-Boo is the quieter of the pair and the most thoughtful, struggling to cope with the worries that seem to sit upon her young shoulders. The story goes back and forth between two different points of view. We see how frustrated Bulboo becomes as well as witnessing how Ifwafwa’s mind works – slowly but surely. Ifwafwa is like a gentle giant, a snake whisperer of sorts; he reminded me of the character John Coffey in the film ‘The Green Mile’, a beautiful soul with magic in his essence. I won’t tell you what Winifred is facing in her future, as I don’t want to spoil the story for you. However, on reading the story, I could understand how Amnesty International endorsed this book as it deals with basic human rights. The crimes committed against Winifred and her mother led to their human rights being taken away and still occur today in many civilisations all over the world. It is distressing to think that young girls suffer as much as they do and I do think this is one of those books that needs to be read to show the world how wrong it is and hopefully help in bringing about change as one voice grows louder and merges with others into a choir. The way that Bul-Boo and Madillo deal with the situation that beholds Winifred, is through the eyes of a child, so we do not witness any graphic descriptions, we just see it simply as a child would see it. This is a book I would recommend to be used in schools as part of PSHE. It is a poignant story told through the eyes of a child, but with a little laughter and happiness thrown in too. A must read for all. A review in Bookbag written by Mary Esther Judy who also reviewed the book for Inis (see below). I love that she speaks so warmly of Ifwafwa as he is a favourite of mine. Thank you Mary, a true champion of children’s books in Galway and bey0nd. If you haven’t already then take a look at Mary’s Fallen Star Stories blog or, if you are in Galway, pop in to see her in Dubray Books. ‘The Butterfly Heart’ takes place in Zambia, the beautiful ‘butterfly heart’ of Africa. The story is told through two voices: Bul-Boo, a young girl who lives with her family and twin sister Madillo, and Ifwafwa, the Snake Man. He is old and wise and has the unique ability to communicate with snakes. The twins’ lovely and gentle friend Winifred is in trouble. Her father has died, and his brother has arranged for her to marry his friend, a man old enough to be Winifred’s grandfather. Winifred seems resigned to her fate, but Bul-Boo is determined to do something, and in desperation, the twins turn to Ifwafwa. Leyden has drawn attention to the issue and tragedy of child marriage in Africa, while simultaneously blending the refreshing directness of a child’s worldview. The language, story structure and characterisation are simple and very clear. Leyden uses the twins Bul-Boo and Madillo to demonstrate how human nature can divide in a crisis. Bul-Boo is practical and pragmatic, while her twin Madillo is more superstitious and mysterious. Together, the two girls’ dialogue ebbs and flows to create a duet that will make you laugh and cry. Ifwafwa, the mysterious snake man understands the placement of old traditions in society. But he also is in direct conflict with them, as he tries to determine their application in protecting the young, the new and if they have any place in the application of justice and right. It is Ifwafwa’s voice that exposes this part of the story; of a land where the old traditional ways struggle to combine and find peace with the contemporary. All the while, ‘The Butterfly Heart’ never becomes burdensome. While the story deals with difficult, even impossible circumstances, it is not at all didactic or heavy-going. The drawing of the storyline is seamless. Leyden paints a picture of the textural beauty of Africa, and the richness of the people who inhabit it. The descriptive quality is exquisite without being overly laboured. With genuine humour and warmth throughout, ‘The Butterfly Heart’ compels the reader gently and quietly forward to a very satisfying ending. It is, quite simply, beautiful. A book to be loved and pondered over with tenderness. A review by Jane Mitchell, author of the wonderful, award winning Chalkline (among others) and a fellow Walker author! This appeared on her blog on June 16th. Set in Zambia, the butterfly heart of Africa, this lyrical story tells of the fate of bright little Winifred when her uncle forces her into an arranged marriage with an old man from another village. Not only will this result in the end of her schooling and her freedom, but the end of her happy childhood. Told mainly through the eyes of her best friend, the observant and spirited Bul-Boo, there are also chapters by Ifwafwa, the snake man, to whom Bul-Boo turns for help, and by Winifred herself. Character development is excellent throughout, from the main characters to those with a less significant role to play. The adult wisdom and considered pace of Ifwafwa contrast well with that of eager Bul-Boo, while the interaction between Bul-Boo and her dizzy twin sister Madillo is well-observed and finely-drawn. Sister Leonisa, the children’s teacher, is hilarious; in fact throughout the novel, Paula Leyden successfully uses opportunities for humour to lighten what might otherwise be an overly dark tale. The setting is vivid, with wonderful detail of life in rural Zambia, which is clearly familiar to her. While the overall tone of the book is gentle, the author is not afraid to tackle what is a challenging and difficult subject: that of child marriages, a real feature of life in many parts of Africa, and is to be commended for doing so. The book is endorsed by Amnesty International as contributing to a better understanding of human rights and the values that underpin them. The conclusion—with just the right touch of mystery—brings the novel to a satisfying finale. Siobhán Parkinson at the Dublin Writer’s Festival on May 26th as part of the panel discussion on What makes a great children’s book. She picked Butterfly heart as one of her three book choices. I like this book very very much. It’s called The Butterfly Heart, it is by Paula Leyden and it is set in Africa, in Zambia. The title comes from the idea that Zambia is shaped like a butterfly and is in the heart of Africa. I looked at the map and it does look a bit like a butterfly, but it is not in the HEART of Africa, let’s face it, it is probably around the knee joint! But the book is wonderful. You know how people are drawn to certain places and a lot of people are drawn to Africa. I’m not in fact particularly drawn to Africa but after reading this I might just go to Zambia. It is the most wonderful evocation of place that I think I’ve ever read in a book, and it is a very loving evocation. There are several voices in the book and the voices are absolutely authentic. As I said earlier I think it is voice that is more important than anything. I am going to say now something that might be regarded as controversial, but I think voice is more important than story. It’s a bit of a sacred cow, this thing about story, and everyone is always talking about story, story, story. Of course there has to be a story, but the voice is the most important thing in a book, in my view. It’s what draws you in. The story makes you turn the pages, the narrative suspense makes you want to go on, but it is really the voice that remains with you after you close the book. And that’s why I love this book. What I love are the voices of these wonderful African children, these children of all kinds of mixed backgrounds living in Africa. And there is an adult voice too, that of the mysterious snakeman, Ifwafwa. There is a story here as well, and there is even a theme: it is about a particular issue, which is child marriage. The issue is extremely well handled, very subtly dealt with. But what you bring away from this book is not just a sense of that issue of child marriage. What you bring away from it is this wonderful sense of place and these fantastic voices that carry on living in your head long after you’ve closed the book. In the same way as the voice of Nesbit’s Oswald Bastable (whom we quoted earlier) is with you many years later. The Butterfly Hearttakes place in Zambia, the beautiful ‘butterfly heart’ of Africa. The story is told through two voices: Bul-Boo, a young girl who lives with her family and twin sister Madillo, and Ifwafwa, the Snake Man. He is old and wise and has the unique ability to communicate with snakes. The twins’ lovely and gentle friend Winifred is in trouble. Her father has died, and his brother has arranged for her to marry his friend, a man old enough to be Winifred’s grandfather. Winifred seems resigned to her fate, but Bul-Boo is determined to do something, and in desperation, the twins turn to Ifwafwa. Leyden has drawn attention to the issue and tragedy of child marriage in Africa, while simultaneously blending the refreshing directness of a child’s worldview. The language, story structure and characterisation are simple and very clear. Leyden uses the twins Bul-Boo and Madillo to demonstrate how human nature can divide in a crisis. Bul-Boo is practical and pragmatic, while her twin Madillo is more superstitious and mysterious. Together, the two girls’ dialogue ebbs and flows to create a duet that will make you laugh and cry. While the story deals with difficult, even impossible circumstances, it is not at all didactic or heavy-going. Leyden paints a picture of the textural beauty of Africa, and the richness of the people who inhabit it. With genuine humour and warmth throughout, The Butterfly Heart compels the reader gently forward to a very satisfying ending. 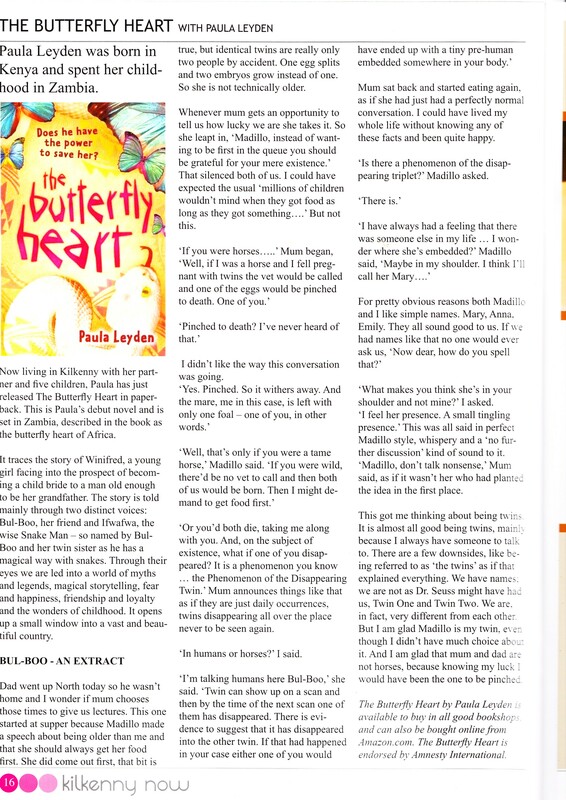 The Butterfly Heart by Paula Leyden (Walker E7.10). The butterfly in the title is descriptive of the shape of Zambia. It is here in a rural part of the country that twins, Bul-Boo and Madillo live with their family. The first time Bul-Boo realises her friend Winifred has a problem is when she notices the girl’s progressive disinterest in the things that used to make them laugh. When she finally winkles the shocking truth from Winifred, Bul-Boo is horrified. Winifred’s father is dead and his brother is now arranging for the girl to be married to his best friend. Childhood naivety and humour and the harshness of ancient folk customs are blended skilfully together in this superbly written atmospheric story. Review by Jean Flitcroft, author of the Cryptid Files: Loch Ness published by Little Island. What an enjoyable read! The Butterfly Heart is beautifully written and the quirky characters are deftly drawn. Although a children’s book it is hugely successful in the way it handles the serious issue of child marriage in Africa which lies at the very heart of the story. Having said this, its not an earnest book in any way, it’s really fun to read. The main characters, the twins, made me laugh out loud with their insightful and eccentric take on life. I can’t wait to read Paula Leyden’s next book. Review by Ellen Banda-Aaku, author of Wandi’s Little Voice , the winner of the MacMillan Writer’s Prize for Africa, New Children’s Writer Award. The Butterfly Heart is beautifully written and reading it for me was a journey back into my childhood. Having grown up in Zambia, as I read the story I could see, feel and smell my childhood through the vivid narrations of the main characters. By tackling the difficult and unsavoury subject of child marriage through the eyes of young characters, the author subtly and effectively brings to the fore the unpleasant realities of this practice. JUST A BIT OF SPRINGTIME READING….. There are some great new books out over the last few months, and with a two weeks holiday coming up for the schools, allow me to recommend some wonderful reads…Spirit of the Titanic by Nicola Pierce: The familiar Titanic story told from a truly unique perspective. Dead Hairy by Debbie Thomas: great fun, loaded with laughs… this one is a pure delight. A Year Without Autumn by Liz Kessler : I really think Liz Kessler tells a wonderful story in this, her latest book. Well-written, intriguing, beautiful! Thin Ice by Mikael Engstrom : A must-read for ages 11yrs. +; this story of a young boy’s search for a real home, where he actually feels he belongs, and the struggle and journey to get there is told with compassion and humour. Artemis Fowl and the Atlantis Complex by Eoin Colfer : out now in paperback… in fact, the entire series to date has just been re-jacketed. If you haven’t read the adventures of the young criminal master-mind, do so immediately. 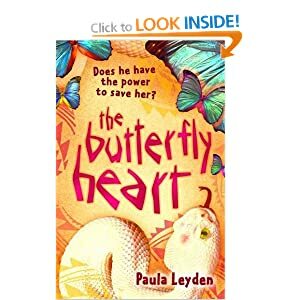 The Butterfly Heart by Paula Leyden : A lyrical story from Zambia, Bul-boo and Madillo are powerless to save their friend Winifred from a horrible fate, so they rely on Ifwafwa, the snake man, to help them… before it’s too late. Beautiful! An excerpt from the book appeared this week (April 20th) on the website Storytime as well as a short bio. Thanks to Ivor Hartmann. Kilkenny woman Paula Leyden’s debut novel, The Butterfly Heart (Walker, €6.99) is a colourful tale of friendship and social justice set in Zambia, where she grew up. When Bul-Boo and Mandillo discover that their friend, Winifred is about to be married off to a man old enough to be her grandfather, they are outraged. But what can they do to save her? Leyden’s intimate knowledge of Zambia and its customs shines through in this lyrically written novel for readers of ten plus. Sarah Webb. I loved The Butterfly Heart – it’s so beautifully written and addresses difficult issues with great sensitivity and compassion. A wonderful first book. A review appearing on writing.ie, beautifully written by eleven year old Sophie O’Loughlin. Writing.ie is, quite literally, what it says on the box. Take a look! The Butterfly Heart is a lovely story set in Zambia, Africa. It is about twins Bul-Boo and Madillo who are trying to save their friend Winifred from a horrible fate. They call upon Ifwafwa, the village snake charmer, to ask him for help and advice. But Ifwafway is slow, so the twins take matters into their own hands. They consider talking to their other friend Fred’s Granny who he says is a witch.But Bul-Boo is scared of Fred’s Granny. Bul-Boo considers hiding Winifred in a cupboard in her house until the trouble has passed. Will Bul-Boo’s plan succeed? Will Ifwafwa strike before it’s too late? Find out by reading The Butterfly Heart! A reader’s review from Vukani Nyirenda, the author of Kalimatundu Tales ( site specialising in Zambian folklore) and of Kalulu the Hare Outwitted. The Butterfly Heart is clear, informative and extremely objective. Not like the antropological texts. I like your style, too: use of multiple view points, giving each character an opportunity to say what they want to say in their own voice. The only other author I know who does this excellently is Barbara Kingsolver, especially in her book The Poisonwood Bible which is set in the Democratic Republic of the Congo. You also have a knack for giving lots of information about the setting in few, carefully crafted words. Not an information dump! You show you know your setting. But this knowledge is set in action driven stories. While I worked at the University of Zambia and in the civil service as permanent secretary, I visited all provinces, including my own. Thus I am very familiar with Zambia and I can tell if someone is not telling the truth. You have passed the test. Hughes & Hughes Photos of Paula Leyden signing copies of the fascinating ‘Butterfly Heart’ in Hughes & Hughes Dundrum. This lyrical tale from the butterfly heart of Africa tells the story of twins who try to help their friend who is being married off to a man old enough to be her grandfather. A truly gorgeous and touching tale, ‘Butterfly Heart’ will enchant both Independent and Young Adult readers. We’re proud to make it a Staff Pick of the month and wish Paula every success with this, her first novel. Thank you so much for dropping in. It was a pleasure and we hope to see you again very soon. Walker Books, 2011. ISBN 9781406327922. (Age: 12+) This charming story takes place in Zambia where twins Bul-Boo and Madillo live with their parents and a colourful assortment of friends and neighbours. When they discover that their school friend, Winifred, is destined for a terrible fate, the girls feel compelled to help. Bul-Boo seeks the help of Ifwafwa, the wise snake man but can he deliver a solution before it is too late? Fred, who lives next door, thinks his great grandmother can help. She is rumoured to be like a witch with magical powers but she inspires awe and terror in equal measure in the children. The author spent her childhood in Zambia and her knowledge of local traditions, stories and customs make this story a delightful insight into the ‘butterfly heart of Africa’. Superstition and logic interweave as the characters seek a solution to their problem. The story is essentially told in first person from the viewpoints of Bul-Boo, Ifwafwa and Winifred which sustains the momentum of the story. The chapters are short making it easy to read. Probably best suited to younger teens, it is a very enjoyable read.